The instant Support solution that works in unison with essential business software to give your entire organisation comprehensive training and support on demand. 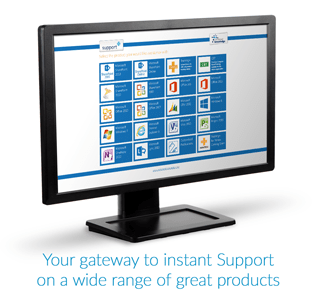 Aimed at all user levels and delivered in a broad choice of different formats, Support+ covers all of your support and training in one solution. Whether your company consists of 10 or 10,000 people, every user should have on-demand access to effective training and support wherever they need it. Support+ is filled with 1,000’s of help topics that can be delivered in quick and simple steps, with detailed and in-depth steps, or how-to videos depending on what you prefer at your time of need. Support+ is a collection of 1,000’s of help items and actions delivered instantly to the user’s desktop via video, in-line demonstrations, How To Steps (with a choice of basic and detailed), Hints and Tips, Detailed Explanations of features, and many more methods with an easy to use Search system, A-Z index and even in-context topics based on what you’re doing right now*. Need to upload your document to SharePoint fast but not sure how? Want to make your PowerPoint Presentation sparkle with a theme but need a quick guide? Support+ walks you through it. Need to apply numbering to your list in Word for the first time? Support+ will make sure you know how.